by Moriarty, Sandra; Mitchell, Nancy; Wood, Charles; Wells, William D.
For courses in introductory advertising. Advertising & IMC: Principles and Practice presents the strategic use of communications to engage different types of consumers. 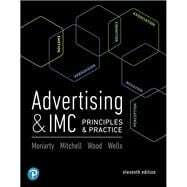 Covering advertising, public relations, direct marketing, promotion, and more, Advertising & IMC uses examples of award-winning brand campaigns, contributions from experts, and enduring principles and practices to provide readers with a practical guide to executing integrated marketing communications. And with a new author joining the team, the 11th Edition features a significant reorganization and revision of the material. Now, readers will understand not only the types of marketing communication possible, but also their application of strategy and planning, and how these areas work together -- ensuring they’re prepared to deal with the latest industry practices in their future careers. MyLab™ is the teaching and learning platform that empowers instructors to reach every student. By combining trusted author content with digital tools and a flexible platform, MyLab personalizes the learning experience and improves results for each student. Optional: one sentence for discipline-specific benefit can go here. Note: You are purchasing a standalone product; MyLab Marketing does not come packaged with this content. Students, if interested in purchasing this title with MyLab Marketing, ask your instructor for the correct package ISBN and Course ID. Instructors, contact your Pearson representative for more information. Moriarty is the cofounder of the Integrated Marketing Communication graduate program at the University of Colorado. Now retired, she has also taught at Michigan State University, University of Kansas, and Kansas State University, where she earned her PhD in education. She specialized in teaching the campaign course and courses on the creative side--both writing and design. She has worked in government public relations, owned an advertising and public relations agency, directed a university publications program, and edited a university alumni magazine. She has been a consultant on integrated marketing communication with agencies such as BBDO and Dentsu, the largest advertising agency in the world, and with their clients in the United States, Europe, and Asia. Professor Moriarty has published widely in scholarly journals on marketing communication and visual communication topics and has authored 12 books on advertising, integrated marketing communications, marketing, visual communication, and typography. A classic book on integrated marketing, Driving Brand Value, was written with coauthor Tom Duncan. Most recently she has authored the Science and Art of Branding with Giep Franzen, University of Amsterdam. International versions of her books include Spanish, Chinese, Taiwanese, Korean, Japanese, and an English-language version for India. She has spoken to groups and presented seminars in most European countries, as well as Mexico, Japan, Korea, India, New Zealand, and Turkey. Mitchell is professor of advertising in the College of Journalism and Mass Communications at the University of Nebraska-Lincoln, where she’s taught since 1990. She served as chair of the advertising department for 11 years before heading the graduate program in her college. Prior to her tenure at the University of Nebraska, she taught at West Texas A&M University. She’s taught a variety of courses, including advertising principles, design, copywriting, research and strategy, and campaigns and media ethics. She worked as an advertising professional for 15 years before entering academe. She gained experience as a copywriter, designer, editor, fund-raiser, and magazine editor in an array of businesses, including a large department store, a publishing company, an advertising agency, a newspaper, and a Public Broadcasting System affiliate. Her research focuses on creating effective advertising messages to underrepresented groups, ethical issues, and assessment of student learning. Nationally, she served as Advertising Division Head for the Association for Education in Journalism and Mass Communications. She serves on the editorial boards for Journal of Advertising Education and Journalism and Mass Communication Educator. Dr. Wood is a marketing professor at the University of Tulsa. His background and training include degrees in engineering, journalism, business, and a dozen years working in industry. Before becoming a business professor he worked as an engineer for a Fortune 500 firm, and helped launch and manage a successful stage production company and agency. He previously served as faculty at Mississippi State University and the University of Missouri where he earned his PhD in Marketing. Dr. Wood’s scholarly work has been published in leading journals such as the Journal of Advertising, Journal of Retailing, Journal of Business Ethics, Business Horizons, and Journal of Marketing Education. His research and teaching have received national and international recognition. He has taught courses at universities in Austria, India, Ireland, and Italy, has traveled across Cuba, and had the unique experience of conducting business in the former USSR. Dr. Wood enjoys developing and sharing fresh approaches to higher education, and helping students work on a variety of projects for small businesses and non-profits. He reviews for numerous marketing conferences and journals and serves on the editorial review boards of the Journal of Marketing Education and the Journal of Business Market Management. One of the industry’s leading market and research authorities, Wells is a retired Professor of Advertising at the University of Minnesota’s School of Journalism and Mass Communication. Formerly Executive Vice President and Director of Marketing Services at DDB Needham Chicago, he is the only representative of the advertising business elected to the Attitude Research Hall of Fame. He earned a PhD from Stanford University and was formerly Professor of Psychology and Marketing at the University of Chicago. He joined Needham, Harper, Chicago as Director of Corporate Research. Author of the Needham Harper Lifestyle study as well as author of more than 60 books and articles, Dr. Wells also published Planning for ROI: Effective Advertising Strategy (Prentice Hall, 1989). 18. Social Impact, Responsibility, and Ethics: Is it Right?